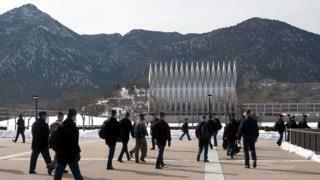 Racial slurs have been found scrawled on dormitory doors of five black cadets at the Air Force Academy in the US state of Colorado, officials say. The epithet, together with the words "go home", were scrawled on message boards affixed to doors facing the hallway on Wednesday night. The mother of one student posted images of the vandalism with the comment: "This is why I'm so hurt!" The academy's security forces are investigating the incident. Superintendent Lt Gen Jay Silveria said in a statement: "There is absolutely no place in our Air Force for racism - it's not who we are, nor will we tolerate it in any shape or fashion. "I've said it before, the area of dignity and respect is my red line. 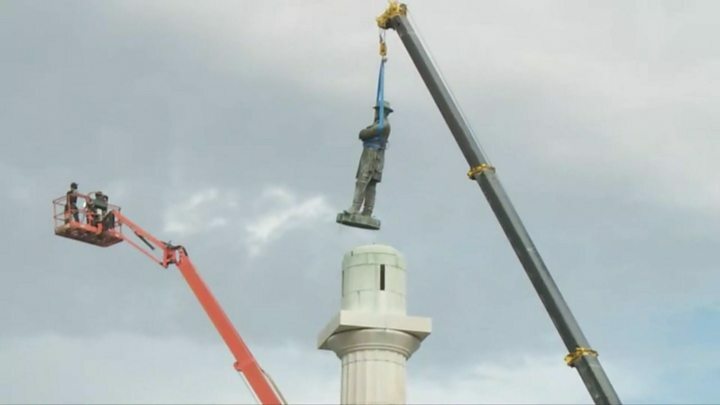 "Let me be clear: it won't be crossed without significant repercussions." In a now-deleted Facebook post, the mother of one student fumed: "These young people are supposed to bond and protect each other and the country. "Who would my son have to watch out for? The enemy or the enemy?" The incident took place at the academy's Preparatory School, where students who were not admitted to the full academy are given 10 months to prepare for a possible transfer. More than 4,000 cadets are based at the campus.